After the goal he scored against Genoa two weeks ago, Cristiano Ronaldo reached an all-time record for which he was recognized by the Juventus president. It is evident that during our lifetime, we will never see another goal-scorer quite like Cristiano Ronaldo and the whole Juventus crowd along with their president made sure he knew it this Saturday. The Portuguese forward has done something that Lionel Messi will only dream of after he retires, which is to become the most accomplished forward of all the major European leagues ever. For Juventus since he arrived, Cristiano Ronaldo has already scored 7 goals and with the one he netted against Genoa 15 days ago, he reached the 400-goal barrier which has never been done before. At the age of 33, Cristiano Ronaldo is the first ever player who has scored this number of league goals in football history and his toll went up to 402 with his brace at Empoli last week. 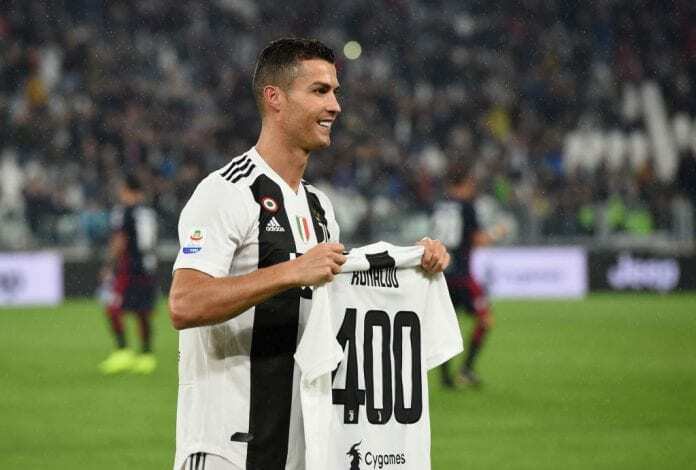 This Saturday before Juventus faced Cagliari, the Portuguese player received an honor from the Juventus president himself and a standing ovation before the match as he received a jersey with the number 400 on it to represent this unique milestone of his career. This treatment that Ronaldo is getting, is very well-deserved and his smile revealed how happy he is after moving from Real Madrid to the Italian giants. Even if Cristiano Ronaldo wasn’t able to score a goal this Saturday against Cagliari, the star did provide Cuadrado with an assist and completed the best start in Serie A history for any Italian club ever with the 3-1 victory. The Vecchia Signora is looking quite powerful this season, just a few days before receiving Manchester United in the Champions League and warning every single club in Europe of their obvious claim for this year’s title. As things are right now, only FC Barcelona is looking powerful enough to face Juventus and it appears that the particular battle between Ronaldo and Messi has just suffered a slight modification. It was just like the times when Cristiano played for Manchester United, football dominance is where ever he decides to play, and also where Messi plays. The Argentine will get to reach the staggering number of league goals that Ronaldo reached this season, as he has already scored 390 La Liga goals and he will surely get past this number earlier than Ronaldo did. But nobody can take away that fact that Cristiano was the first player who ever got to this mythical number. He should get named into the Guinness World Records’ book for this massive achievement. The fact that Juventus’s president Andrea Agnelli is showing his respect and admiration for Cristiano Ronaldo, also proves that Florentino Perez maybe never had the respect that the Portuguese player demanded from him and the words from his latest France Football interview sound truer than they ever were. The Juventus family treat him as if he had always been a part of it, something that Cristiano Ronaldo never felt from the Real Madrid president during all his time there. The reason Perez’s relationship with him started to wither away, is because the president never really understood the demands from the player and he always was under the impression that his tantrums were because he wanted a bigger paycheck. But Ronaldo has already proved that this is not about money for him, it’s about recognition and feeling wanted at the club you represent. The love story between Ronaldo and Real Madrid, will forever be stained by this stupid issue because Florentino Perez doesn’t have enough empathy to understand the best player he ever brought to the club when he was the president. Cristiano’s dramatic exit from the club, will forever be known as the biggest mistake in Florentino Perez’s illustrious tenure for Los Blancos. What do you think about Cristiano Ronaldo’s record and where would you rank him among the best goal-scorers in history? Please share your opinion in the comment section down below.